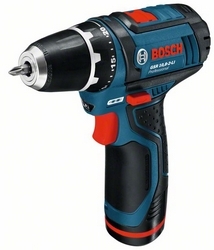 New from blue series Bosch for professionals! With the shortest construction 169 mm in its class for optimum performance especially when drilling and screwdriving overhead and in tight spaces. Professional performance: 2-speed gearbox ensures powerful 30 Nm when drilling (up to 19 mm) and screwdriving (up to 7 mm). Complete 10 mm chuck Auto-Lock. Lowest weight: only 1,4 kg for the excellent job almost without fatigue. Newly developed 2-speed planetary gearbox for powerful screwdriving applications or drilling in wood and metal, and impact drilling in masonry. Very short design (only 204 mm) and ergonomically shaped handle - for optimum working overhead and in tight spaces. 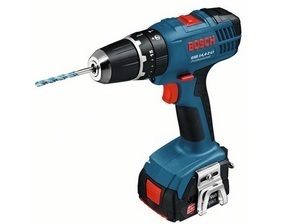 Powerful as a power tool powered by Network: up to 195 drilled holes (6 x 40 mm in concrete) with only one battery charge, optimal for outdoor use. 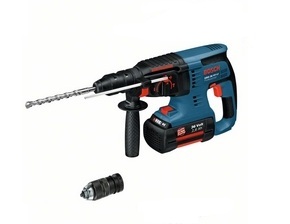 Pneumatic hammer mechanism with chisel function, optimized for drilling holes of 8-16 mm (max. 26 mm).